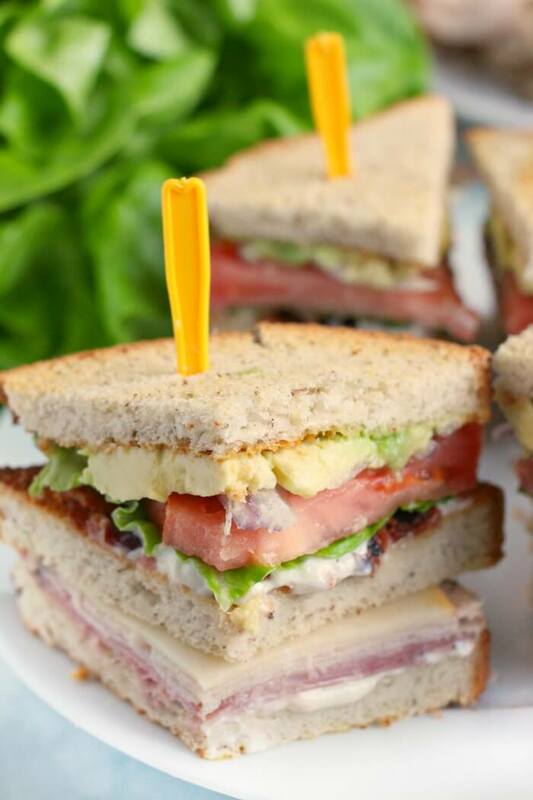 Our Club Sandwich is easy to make, delicious and filling. 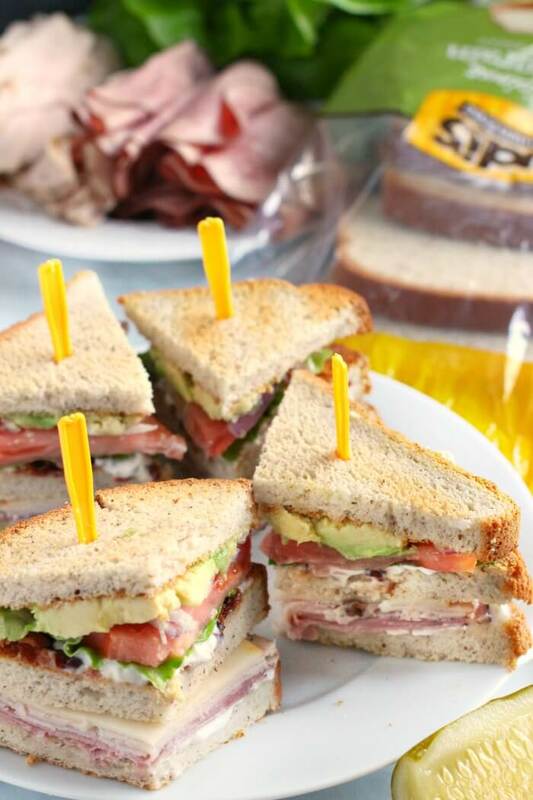 You’ll love this club sandwich for any meal of the day! This post is sponsored by Udi’s® Gluten Free. All comments and opinions are entirely my own. The Club Sandwich is a delicious staple lunch item at most restaurants – so why not make one at home? We love this sandwich with layers of toasted bread, meat, and veggies. Yum! Serve your club sandwich with homemade refrigerator pickles and a cup of broccoli cheese soup (then finish it off with some peanut butter cookies). 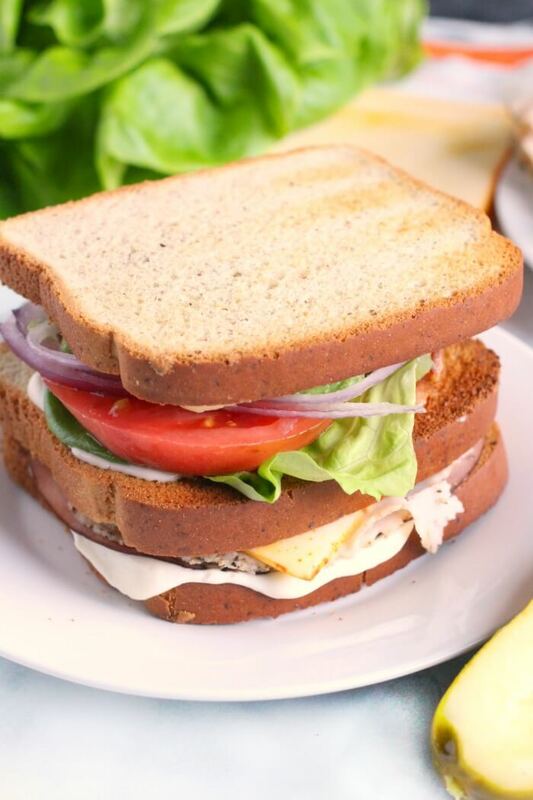 Bread – Traditionally white sandwich bread is called for in this recipe, but we used Udi’s® Gluten Free Multigrain Sandwich Bread for our sandwiches so the whole family could enjoy them. No one even noticed the swap! Make sure to toast your bread for the perfect club sandwich. Meat – I like a combination of sliced turkey and slice ham cold cuts, but you could use rotisserie chicken, or leftover ham or turkey from last night’s dinner too. Mayonnaise – There’s a lot of deliciously toasty bread in this recipe and mayonnaise does a great job of balancing the crunch with some creamy moisture. Tomato – Fresh bright red tomato because it looks good and tastes good. Bacon – We make our bacon in the oven ahead of time and then keep it in the freezer. I usually zap it for a minute or two before adding to the sandwich. I like mine extra crispy! Avocado – This is a slightly controversial addition to the club sandwich, but we are totally Team Avocado in our home. Okay, that’s a lie, my daughter and I are team avocado, but I feel like that’s enough. Lettuce – Typically if you order a club sandwich at a restaurant it will come with iceberg lettuce, but my personal favorite for sandwiches is butter lettuce. It’s gorgeously bright green and tastes great. 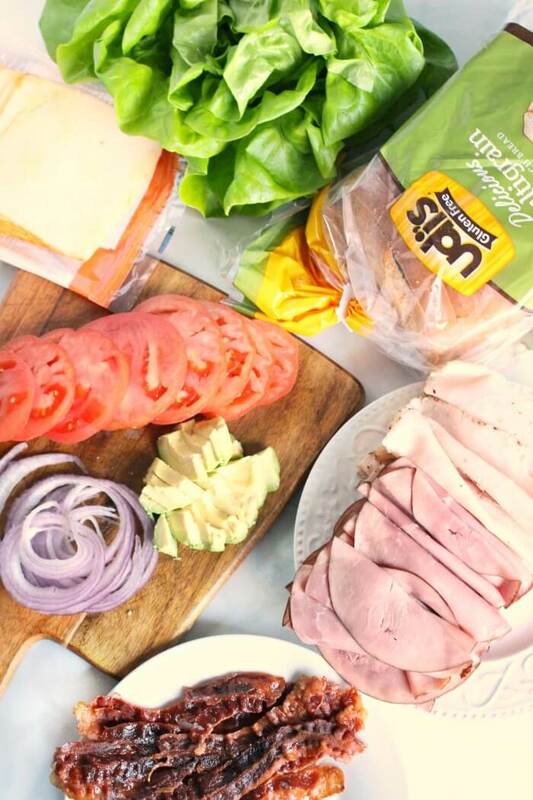 Onion – A few thin slices of red onion (it should really be called purple onion), or better yet pickled onions, makes this club sandwich next level. First, toast bread slices to your liking – we prefer very toasty so they have a nice crunch to counterbalance the soft meat and toppings. For this recipe we used Udi’s Gluten Free Multigrain Sandwich Bread. Next, layer in the following order: toast, mayonnaise, lunch meat, cheese, toast, mayonnaise, lettuce, tomato, bacon, avocado, onion, toast. Finally, cut into triangle shaped quarters and spear each quarter with a toothpick to hold it all together. 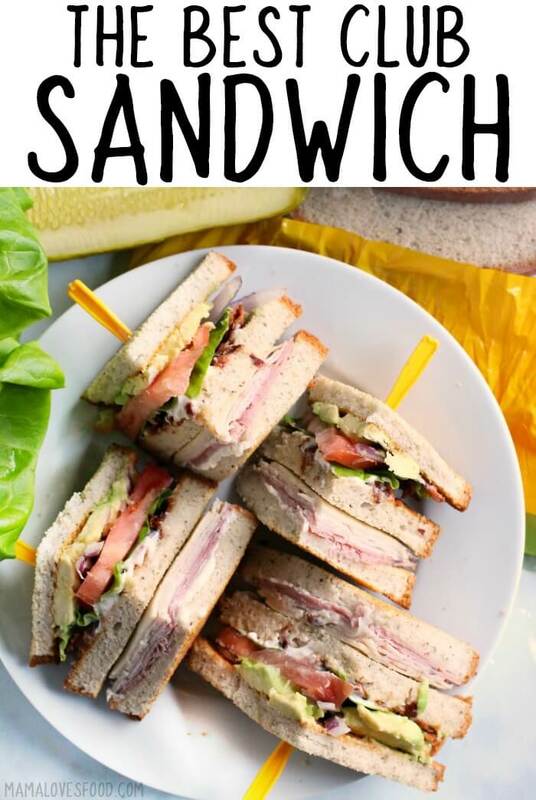 What Bread to Use in a Club Sandwich? 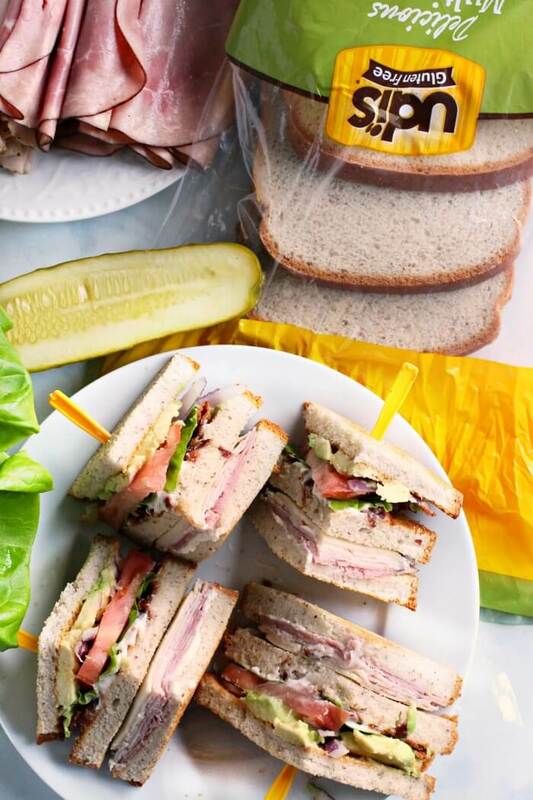 Traditionally, white bread is used in a club sandwich, but we mixed things up a little and used Udi’s Gluten Free Multigrain Bread to make our gluten free club sandwiches. We have a few gluten free folks in our family, so we always have loaves of Udi’s bread on hand. It keeps in the freezer for a long time, so it’s super convenient. We find our Udi’s bread in the frozen/gluten free section at our local Publix. We love it because it’s got a fresh from the bakery flavor and has the perfect texture. Udi’s is a game changer and is the only gluten free bread that delivers a delicious taste, soft texture, and the right size for your needs. 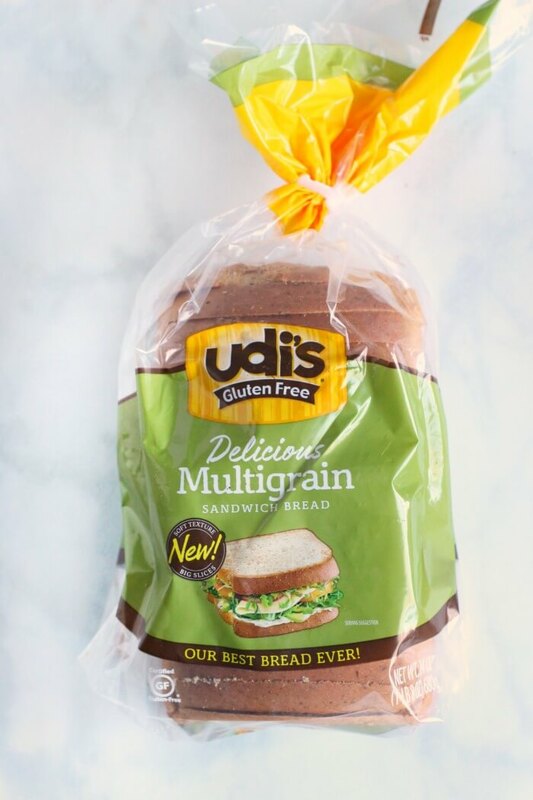 Udi’s 24 oz loaves have a 30% larger slice (mirroring a conventional sandwich bread), is certified gluten free, is dairy and nut free, and on top of that it has a whopping 8 grams of whole grains per serving plus other vitamins and minerals. Whether you prefer breads, pizza, pastas, snacks, or another favorite, Udi’s has the perfect flavorful, gluten free solution. We super love the new 24 ounce loaves with large slices of bread; perfect for hearty sandwiches like this club sandwich! It’s great to be able to enjoy bread. Udi’s makes a variety of baked goods, meals, and snack options to ensure there is something to fit everyone’s taste. From 1/6/19 – 3/10/19 (while supplies last), you can save $1.30 on Udi’s Gluten Free Bread at Publix. 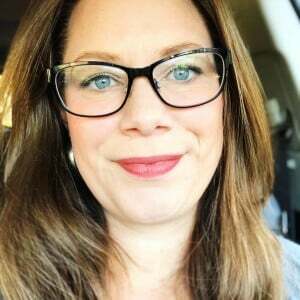 Click here for the savings and make sure to stop by your local Publix! Must be redeemed by 3/24/19. What Meat in a Club Sandwich? Is a Club Sandwich Hot? A club sandwich is not hot, but it is usually served on toasted bread. According to legend (okay, not really legend), the club sandwich was originally served hot, but these days only the bread gets a toasting. 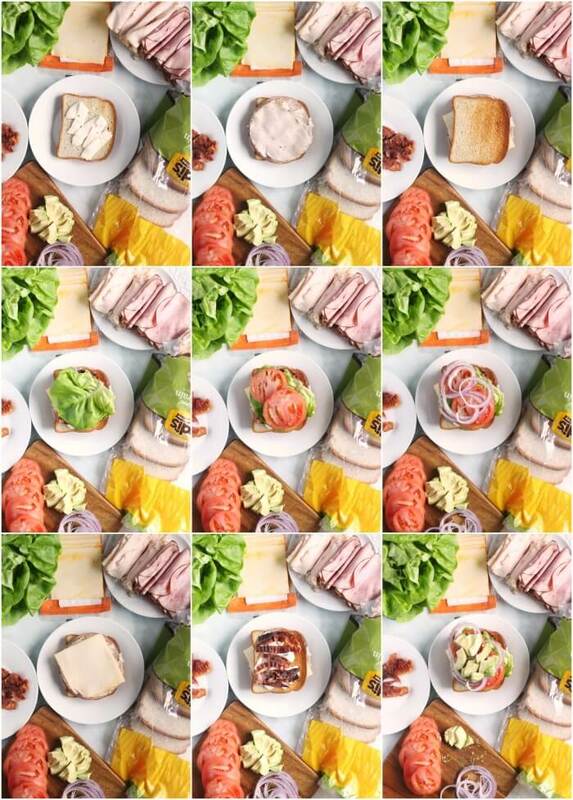 Where Was the Club Sandwich Invented? Not everyone agrees, but the most prevalent theory is that the club sandwich was invented around 1894 at the Saratoga Club House, an exclusive gambling joint in Saratoga Springs, New York. Other folks believe it was developed by the chef at the Union Club of New York City, also in the late 1800s. 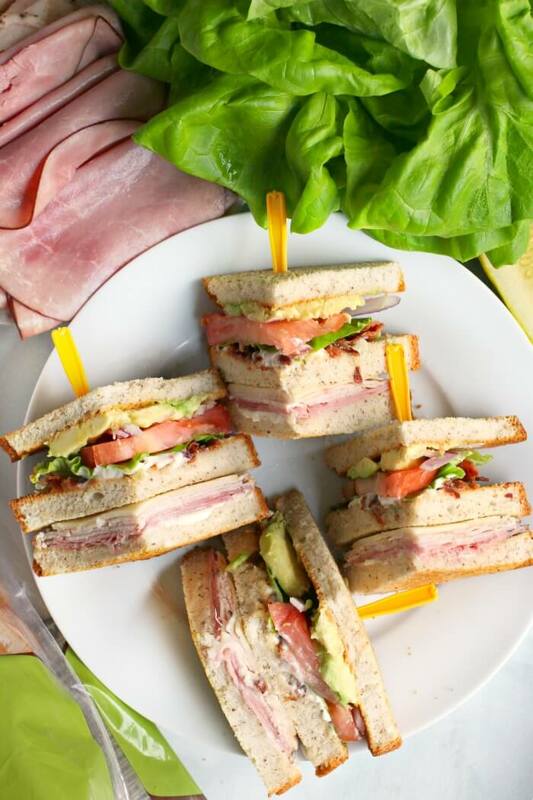 What to Serve with Club Sandwiches? Santuko knife – My favorite knife for cutting vegetables! This knife is the perfect size and shape, handles great, and is super reasonably priced. Also, I just love that it comes in fun colors! End grain cutting board – This is my absolute favorite cutting board and the one that I get the most compliments on. And p.s. I have a lot of cutting boards. It really is absolutely stunning, and knows how to take a beating. We use our end grain board every single day! 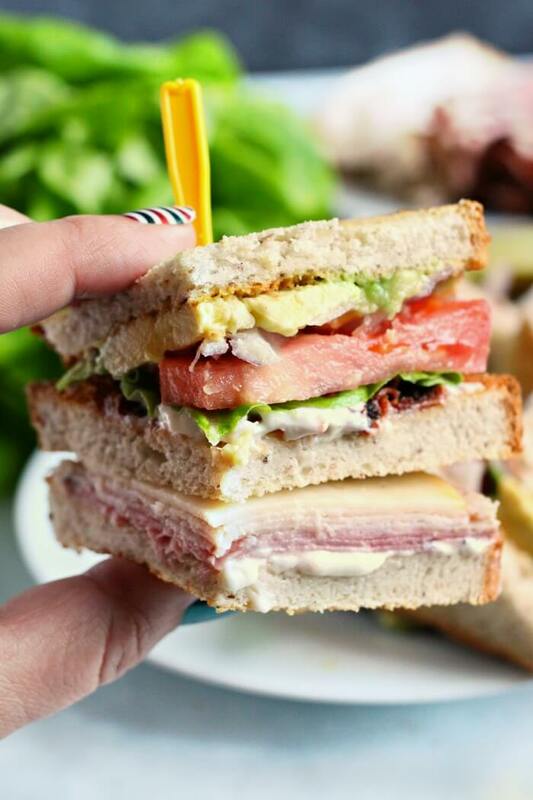 Our Club Sandwich is easy to make, delicious and filling. 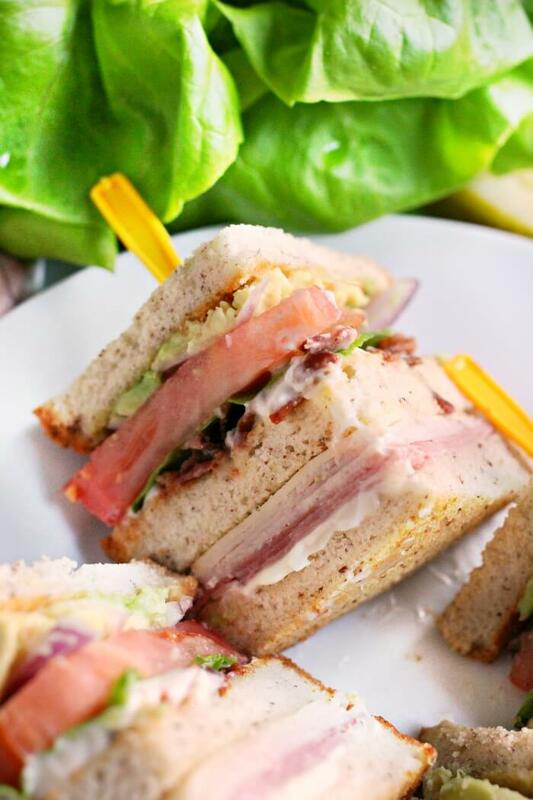 You'll love this club sandwich for any meal of the day! Cut into triangle shaped quarters and spear each quarter with a toothpick to hold them together. Yes! Give me ALL the layers of this club sandwich please! Udi’s bread is my go-to bread for gluten free living. So glad that it is available in so many grocery stores. I’ve always been happy with Udi products. Nice post, and that sandwich looks amazing.